If you have friends in the epilepsy community and the network marketing space, you’ve probably heard about Hempworx. You may be wondering, “Is HempWorx truly a scam?” “Is their CBD oil really that effective?” I decided to try it out for myself and find out what all the fuss was about. I wanted to reduce inflammation in my body and eliminate the couple seizures that I have per year. Read on to find out in my review of HempWorx! Hempworx is a network marketing company whose products are in the CBD industry. Cannabidiol (CBD) oil is a constituent that naturally occurs in hemp. CBD is just one of over 85 cannabinoids identified in the cannabis plant. The Hempworx products are extracted without using solvent for a more pure extract. CBD has been studied and found to have many beneficial effects including seizure prevention and alleviating pain. Hempworx states that it has the most “powerful and potent hemp products on the market.” Unfortunately, this is very difficult to verify. When you start to compare them with other CBD companies, the claims about the purity leaves one to question what is the most important aspect in the process of extracting it. HempWorx products are made from industrial hemp plants that are grown on farms in Kentucky. Hempworx has 11 hemp-derived products for its representatives to sell. They consist of 6 tinctures, 3 topicals, 2 pet products. All of these products have a 30 day money-back guarantee making trying the products risk free. PRO #1: You can buy this CBD oil in all 50 states. It is legal and there is a market for it. In fact, this may be one of the better MLMs to get involved with because in many states, there are not dispensaries which are competing with it. PRO #2: The product is effective at preventing seizures and there is documented research to support this fact. PRO #3: There are lots of anecdotal testimonies and even some youtube videos demonstrating the difference in autism symptoms when the children are on CBD. PRO #4: You can become an affiliate with Hempworx if you don’t want to do the whole team building, etc. The cost to become an affiliate is only $20. PRO #5: You can get your money back if you decide that the CBD oil isn’t right for you. You do have to make the request within the first 30 days of ordering the product! PRO #6: I really enjoy the taste of the peppermint oil. It doesn’t seem to taste earthy at all. The peppermint essential oils that were added remind me a bit of peppermint tea. They seem to really open up the nasal passages and make breathing easy. CON #1: It may not be work for you. CON #2: The cost of this product is a bit higher because it is associated with a network marketing business opportunity. CON #3: They only give you 30 days to try the product out before you decide you want a refund. However, the representatives will tell you to give it a few months before making a decision on the product. So, you aren’t supposed to see results for 90 days, but you only have 30 days to ask for a refund. You aren’t supposed to know if it works in 30 days. This is a common practice with all MLMs. 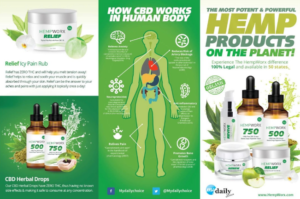 Who is Hempworx CBD oil for? One of the most compelling reasons to start taking CBD oil is to reduce inflammation. CBD oil is a great supplement for people who have autism, epilepsy, Alzheimer’s and Parkinson’s. However, many people are discovering that CBD oil works well for alleviating their pain as well. Cannabidiol works on the neurological system as well as the immune system. People who have problems with their nervous system or their immune system may see an improvement in symptoms. Unfortunately, I didn’t find much training in how to dose the product when I purchased it. I read the instructions on the label and followed their standardized dose recommendations. I also watched quite a few youtube videos about CBD oil and discovered that there are many subtle nuances when it comes to dosing. You may discover that you simply need a small amount. I found the lack of information about dosing somewhat disappointing. The representative that sold the product to me checked with me to see how I was doing on the product. She was confident that the side effects that I was experiencing (hunger) would subside. They did, so I’m not entirely certain if they were due to taking the CBD oil. Their email is support@MyDailyChoice.com. They are located in 8840 West Russel Road Suite 245, Las Vegas, NV 89148. You can contact them via phone at 702-793-2826. 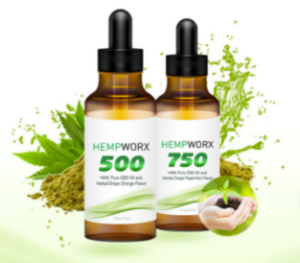 The price of Hempworx CBD oil may shock you initially. A 500 mg bottle is going to cost $69 before shipping. I ended up spending $74 to try out my first bottle. These prices are comparable to other MLM opportunity prices. However, it is a bit more expensive than other CBD prices that don’t have a network marketing opportunity attached to them. Lazarus Naturals and CBD Distillery have comparable products for half the cost. What you end up paying for with Hempworx is the business opportunity. The business opportunity is similar to other MLMs. There are different levels of committment. If you simply want to add CBD oil to your blog and allow people to discover it through there, you will pay $20 for a 25% affiliate commission rate. For a physical product, that is a really good commission. At a distributor level, you’ll receive commissions up to 50%, but you have to purchase $500 worth of product and a marketing kit. Overall, Hempworx is a decent MLM opportunity that is worth checking out. You can get involved for a reasonable price. Many people don’t have distilleries near them, so the competition is fairly low. The product line is great. The compensation plan focuses on ensuring that retail sales is more important than recruitment. All-in-all, HempWorx seems to be a decent opportunity that’s worth checking out. The product line looks solid, and the compensation plan does a good job at making sure the focus is on retail sales rather than affiliate recruitment. The compensation plan does offer greater rewards when you sign people up for autoship orders. You can then earn things such as TVs, vacations, iPads. As long as you are focusing on retail sales as your primary focus with HempWorx, you can make money with them. These CBD oils are well-made and can help many people. I personally haven’t seen results after taking Hempworx for two weeks, but I haven’t had negative side effects. The one positive thing that I noticed when taking the peppermint flavored CBD oil is that my nasal passages seemed to open up right after taking it. I think that this is an effect from the peppermint essential oils that were added to it. I will mention that in the last two weeks, I haven’t had a seizure, but I don’t have them on a regular basis. Only a few times per year, so it wasn’t expected that I would have one. VERDICT: LEGIT! If you love this company and want to create your own income stream, Hempworx is definitely worth checking out! There is a high demand for CBD oil within the autism and epilepsy community. Is CBD Oil a Drug or a Miracle Superfood? Interesting product for those in need. 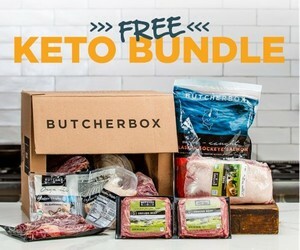 Personally I never heard of these type of products so it was an interesting read for me. Thank you for the information! I have seen advertisements about CBD oil before but didn’t know so much about it. By reading your review I got a completely different understanding about it. I haven’t seen it in stores in Sweden and I don’t know if it’s legal in Sweden? Do you know if CBD can be used against depression? In the last decade depression has increased enormous in Sweden and the medicine offerd by the healt care isn’t the best (I know from self experience) so hoping for something better. I think it would probably help with depression. It isn’t something that I personally have dealt with. However, there have been other testimonials that I have read that it did help with other people’s depression. The product seems to have a lot to offer. Thanks for the education on the product and the opportunity it comes with. How long has the product been in existence? Is the business opportunity opened to everyone, meaning globally? Great article, I really enjoyed reading this! This has really informed me of the pros and cons of this product and if I we’re to buy it I now feel I could make the correct decision for me. Good to have an unbiased opinion! I have been involved in MLM and network marketing over the years. It is something that I want to steer away from. However, I like the fact that this program offers an affiliate program. It also sounds like the product is pretty effective. I like to steer clear of MLM and network marketing as well. I’m not into trying to sell a business opp and a product at the same time.